Playing with magnets is often one of the best introductions to the world of science for young children. By snapping magnets together and watching them push away from each other, children are learning the basics of magnetism and the magnetic force. Many young children are amazed by the magic of magnets. Why not experiment with magic? In this experiment, kids will build a maze and use magnetism to move the key piece through the maze. 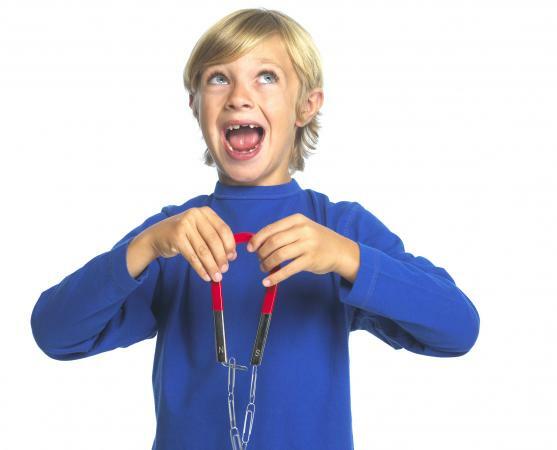 It's ideal for young children and can teach them how magnets are attracted to each other. Glue small ceramic magnets on the bottom of plastic toys to create magnet critters. Draw a simple maze or path on the cardboard using markers and stickers. Place a magnet critter on top of the cardboard maze in the start position. Place the magnetic wand on the bottom of the cardboard at the start position where the magnet critter should attract to the magnetic wand. Move the magnetic wand and critter through the maze to the finish line. For a harder experiment, upper elementary students can do this activity to discover how magnets react to each other in the magnetic field. Connect the ends of two skewers (or wooden dowels), so they overlap slightly with a small rubber band. Connect a third skewer to the first two skewers with rubber bands to make a triangle shape. Cut a piece of string or yarn about eight inches, and tie the end around the ceramic donut magnet. Repeat step one with two additional skewers. Connect the two skewers from step four to the triangle base with rubber bands to form a pyramid. Before connecting the last skewer to the tip of the pyramid, set the string in the middle of the skewers, so the donut magnet hangs from the center of the pyramid about 1.5" from the base. Place two rectangle magnets under the hanging magnet. Gently slide the rectangle magnets around the base of the pyramid. Allow children to move the rectangle magnets around as they please and observe the nature of the donut magnet. This fun experiment shows middle and high school students how maglev trains work. Nail four nails about one-inch apart from each other on each side of the wooden board about eight inches apart. Determine the polarity of each of the large neodymium and place two on each side. Make sure the two magnets of the same side are positioned to repel each other. Cut a thin sheet of plastic to a length of 8" so it aligns with the distance between the two sides of the magnets. Roll the plastic sheet and place a small round magnet at each end of the plastic tube. Tape the plastic sheet, so it forms a tube. Make sure the small magnets are repelled by the large neodymium magnets on the wooden base. Glue each small magnet in place in the plastic tube. At one end glue a pushpin onto the magnet. Use the plastic tube with the pushpin to mark where the thin piece of wood or ruler will be glue (the magnets should be aligned over the large magnets). Glue a thin piece of wood or ruler at one end of the wooden board. A homemade magnetic levitator is a fun tool for teenagers to build to learn about magnetic repulsion and electromagnetism. Maglev trains (bullet trains) found mostly in Japan and Europe, work on a simple principle seen in a magnetic levitator. Plus, it's just cool to see an object float. Place the plastic tube with small magnets at each end above the large neodymium magnets with the pushpin against the vertical piece of wood or ruler. Observe as the plastic tube floats about the other magnets. The magnetic field is an invisible force surrounding Earth every day. Magnets are a fun and great educational tool to teach children of all ages about the theory of magnetism through fun experiments and observations. Through several simple experiments using magnets, children of all ages can learn about magnetism.